A typical pattern for me in regards to my faith-based posts is figuring out how to put my words on paper. This post was no different. I’m no expert on these topics, so who am I to even blog about it? I have been married one month, that’s it. That’s the self-doubt that had flooded my mind and crept in, stopping my fingers from seamlessly typing this post. I may not be an expert but I am an adventurer and life-learner. Just one gal trying to figure out this thing called life and blogging about her process along the way. This week marked one month into a new marriage and blending families. It’s crazy to believe how fast the last few weeks have flown by! One moment we’re exchanging vows and flying to California for a romantic getaway, the next we’re hustling kids around and trying to balance schedules, a new home, and living together. Instantly we’ve become a family of six. Three guys, three gals. His, mine, and ours. Our mini Brady Bunch. Balancing the life of being 30-something newlyweds and raising four kiddos can be adventurous, intense, exciting and scary. Like I said, I’m no expert on blending families or marriage. Or living with the male species, for that matter. Ha! Us girls have been living in an estrogen-filled world for a while now. One day I’ll be able to call myself an expert but right now I’m just learning. Actually, I’ll always be experiencing. Every parent is always learning, whether biological or step, whether raising toddlers or dealing with adult children. The one thing that did prepare me for blending was knowledge. Going into this I expected (and expect) blending to be hard, I had heard all the stories and watched other families attempt to mix and merge with remarriages and stepchildren. Even while dating with children, I set the expectation that it would be hard. Of course, regardless of how much you “predict” to happen, nothing ever prepares you for the future unknowns. In my case, I need to take a chill pill on expecting hardship so much! Yes, experts can’t repeat enough that blending is hard. But ya know what? It’s also NOT bad, horrible, dreadful, or all those other negative words that are sometimes placed on it. In one month I’ve experienced more love and laughter in my home than in years. Whether a honeymoon phase or not, I’ll take it and pray I’m reminded of it when days aren’t always so cheery. 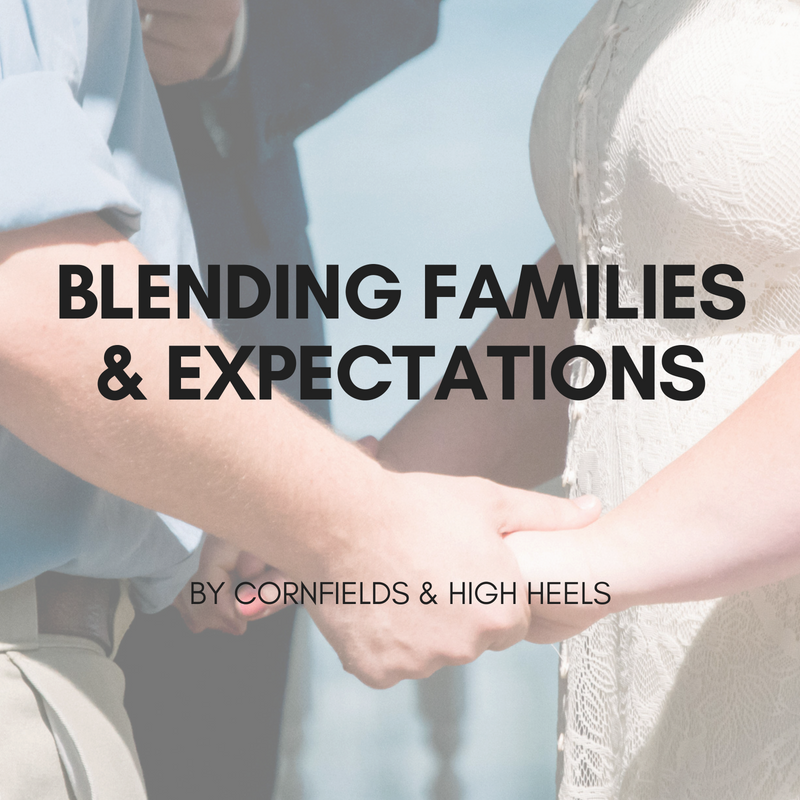 From observation, I notice that most people think “things will be different for us” when deciding on remarriage and blending. Actually, don’t people think this about all changes that require some sort of difficulty? If we’re being honest, most people probably think they can navigate their situation with better results than the last person they witnessed crash-and-burn in the same scenario. I think it’s human nature to think “I’ve got this” and while that confidence and thought isn’t a bad thing, it can be dangerous. It’s a lesson I’ve to learn a time or ten. It’s dangerous because no one has really ever “got it” alone. I definitely don’t. I do need God in my life and for Him to guide me. I need Him because’s He’s “got it” all the time. It’s hard for me to let go of the reigns, I seem to like to sit in the fearful “what if” box a lot (I discussed this in my last post Closing Time – Changes & Chapters). Its when I realize I need to put aside that stubbornness that I learn to chill out, grow, and love more. I’ll need this post to look back on when I do have rough days. I encourage you to dwell on the positives, chill out, and learn through the hardships of life – you might just find yourself laughing and loving more than ever before. This is where I am planted. I am learning, taking risks, chilling out, and loving my simply blended life. Just call me Daredevil Jamie.